Update: After President Donald Trump issued proclamations taking an axe to Grand Staircase-Escalante National Monument and Bears Ears National Monumentin Utah, conservation organizations, represented by Earthjustice, filed a lawsuit attacking the order on Grand Staircase-Escalante on Dec. 4 as an abuse of the president’s power. On Dec. 7, nine conservation organizations, represented by Earthjustice, filed a lawsuit attacking the Bears Ears order, charging that the president violated the 1906 Antiquities Act and the U.S. Constitution by eviscerating the monument. Earthjustice, on behalf of the Center for Food Safety and Center for Biological Diversity, filed a lawsuit on Nov. 28 in federal court challenging the Trump administration’s approval of the enormous groundwater-mining and pipeline project through the Mojave Trails National Monument in Southern California. Earthjustice is representing the Southern Utah Wilderness Alliance, Natural Resources Defense Council, The Wilderness Society, Grand Canyon Trust, Sierra Club, and Great Old Broads for Wilderness in a lawsuit to compel the Interior Department, Bureau of Land Management, and the White House Council on Environmental Quality to respond to seven Freedom of Information Act requests for information related to the Trump administration’s ongoing review of national monuments. The year was 1897. The area in question was the Grand Canyon, which overcame these objections to become a national monument, and later, a national park. More than a century and 129 national monuments later, our public lands have paid dividends—for local economies and our national legacy—on the far-sighted decisions to protect them. More than half of America’s national parks were first protected as national monuments, including Acadia, Olympic, and Zion National Parks. But sometimes the politics of the day obscure the big picture. Enter the Trump administration, the first to ever attempt to reverse a national monument designation. The president’s April executive order directing that 27 national monuments be considered for the chopping block has set in motion a review by the Department of the Interior that is currently underway. The executive order threatens not only some of our nation’s youngest monuments, but also the public lands law that safeguards all national monuments, present and future: the Antiquities Act of 1906. Undermining monument designations and protections would establish a dangerous precedent. Every president since—with the exception of Presidents Nixon, Reagan and George H.W. Bush—has used the Antiquities Act to protect iconic places. The law has also been used to protect cultural heritage sites—from Stonewall to Birmingham to Cesar Chavez’s family home—and tell the more complete story of our nation. 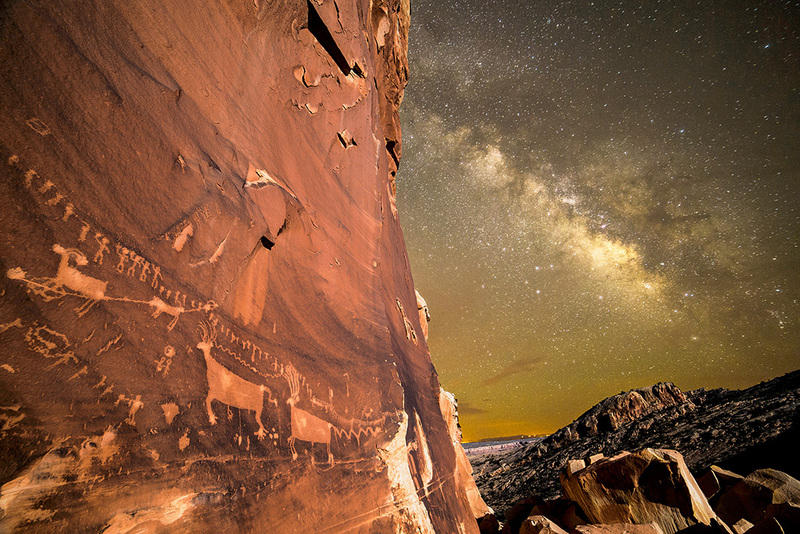 Today, the White House has painted a bull’s eye on 27 national monuments. Any executive order revoking or diminishing a national monument would be contrary to law. The Congressional Research Service itself has found that the Antiquities Act does not authorize the President to repeal national monument designations. Only Congress has that authority. Numerous legal scholars have reached the same conclusion. "The Antiquities Act of 1906 authorizes presidents to designate national monuments, but it does not give presidents the power to reverse the monuments created by their predecessors,” explained Earthjustice Managing Attorney Heidi McIntosh in a TIME Magazine op-ed. The 120 years since the Arizona newspaper editorialized against saving the Grand Canyon have proven that protecting our public lands from extractive industries is a battle worth fighting. In recent months, Earthjustice has begun legal action to protect two of these monuments (Cascade-Siskiyou and Northeast Canyons and Seamounts) from industry lawsuits. We are ready to defend the Antiquities Act itself and national monuments protected under the law. 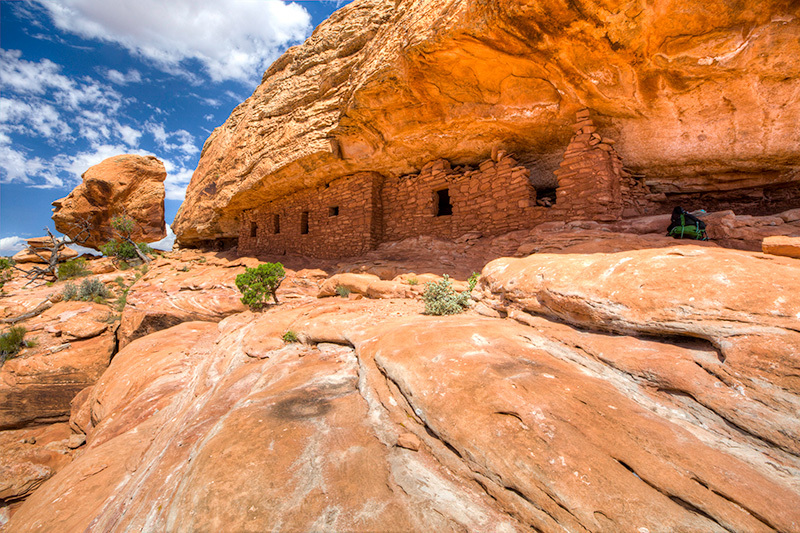 Bears Ears National Monument was designated in response to a concerted effort by the Hopi, Navajo, Ute, Ute Mountain Ute and Zuni tribal governments to seek lasting protection for the unique historic and contemporary cultural values and sites in the Bears Ears region. The monument stretches across scenic mesas, towering sandstone cliffs and canyons that epitomize the beauty of southern Utah. From left: Cedar Mesa Citadel Ruins. Indian Creek. From top: Cedar Mesa Citadel Ruins. Indian Creek. How is Bears Ears particularly at risk? Looting of archaeological sites, uranium mining, off-road vehicle use and other activities have long threatened the area, and will now be curtailed. Yet, extractive industries still have their eye on the monument. Rep. Chris Stewart (R-Utah) says he hopes to carve out coal reserves in Bears Ears National Monument, as the area is “not sensitive land.” On June 10th, Interior Secretary Zinke issued a recommendation to President Trump urging him to shrink the boundaries of Bears Ears National Monument. On Dec. 4, President Trump issued a proclamation that decimated the monument by more than one million acres. Following in the footsteps of the Native American Tribes who sued the President the day the proclamation was issued, Earthjustice is representing nine conservation organizations in a lawsuit filed on Dec. 7, charging that the president violated the 1906 Antiquities Act and the U.S. Constitution by eviscerating the monument. Top row from left: Hans Spliter / CC BY-ND 2.0. BLM. Bottom row: © Steven David Johnson. Clockwise from top left: Great gray owl (Strix nebulosa). Along the Pacific Crest Trail in the monument, summer of 2015. Pacific chorus frogs (Pseudacris regilla) are a ubiquitous presence in the monument. 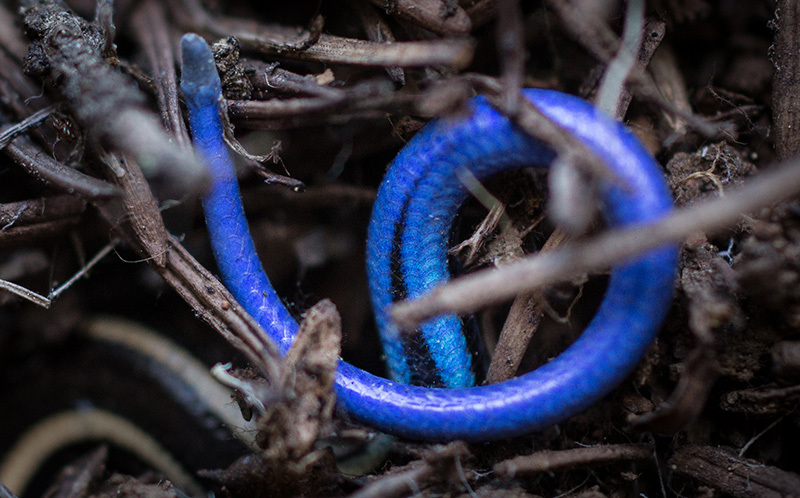 Tail of a juvenile western skink (Plestiodon skiltonianus). 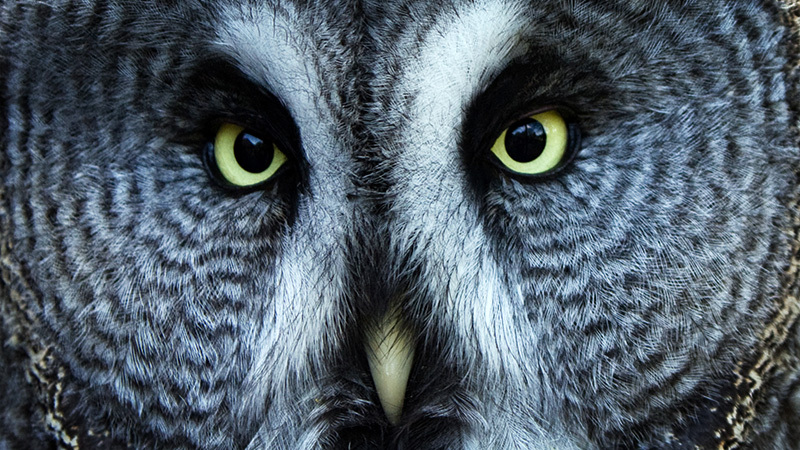 From top: Great gray owl (Strix nebulosa). Along the Pacific Crest Trail. 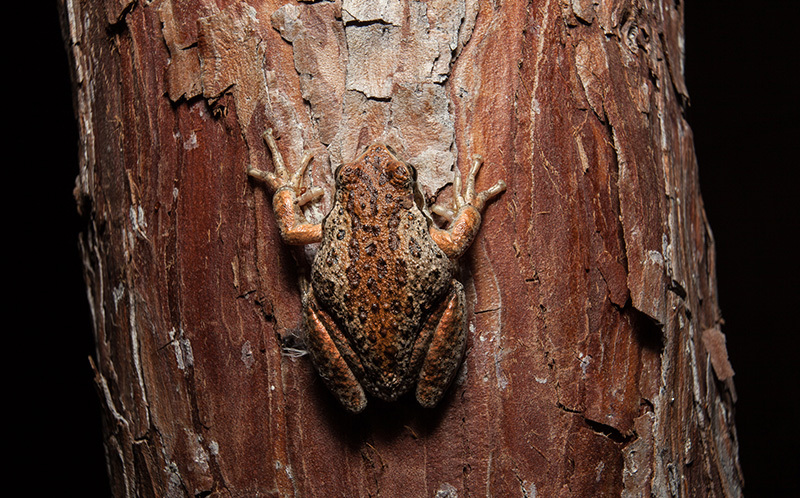 Pacific chorus frogs (Pseudacris regilla) are a ubiquitous presence in the monument. 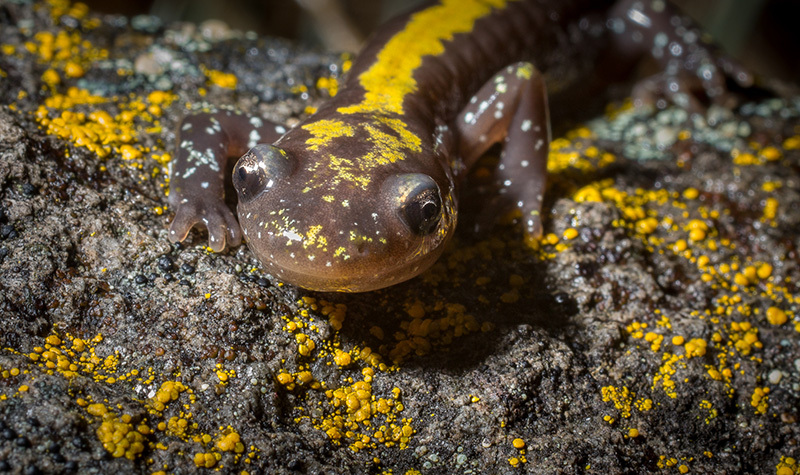 The first monument designated specifically for its vibrant biodiversity, the Cascade-Siskiyou National Monument protects public forests, meadows, mountains and streams spanning Oregon and Northern California. The Cascade-Siskiyou National Monument area serves as a biological corridor for plants and animals to move between distinct eco-regions, providing a gateway for the Pacific fisher, mule deer, gray wolves and spotted owls, among other species, and also a designated winter range for black-tailed deer and Roosevelt elk. Seventy scientists and the governments of the two towns closest to the monument joined a call in 2011 from 15 independent scientists for an expansion of the monument. 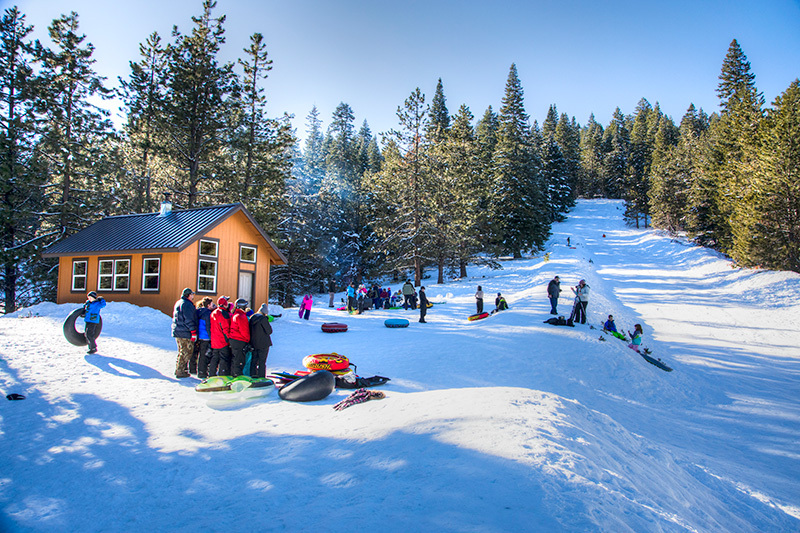 How is Cascade-Siskiyou particularly at risk? The timber industry and its allies, who would like to open up these forests for unsustainable logging, have brought three lawsuits. Interior Secretary Zinke traveled to Oregon in July and met with county and timber industry representatives challenging the United States in federal district court over the expansion of Cascade-Siskiyou—without public notice to organizations and entities that support the monument, including Senator Wyden, Senator Merkley, and Governor Brown. Earthjustice is part of a team defending Cascade-Siskiyou in court. Meanwhile, in Congress, the so-called “Resilient Federal Forests Act of 2017” (H.R. 2936)—more appropriately titled “Massive Gift to the Timber Industry at All Costs Act of 2017”—would override Cascade-Siskiyou’s National Monument designation. The bill passed the House Natural Resources Committee in late June and will soon be headed to the House floor for a vote. Tell your representative to vote NO on this dangerous bill, and protect our forests. Clockwise from top: Bob Wick / BLM. Frank D. Lospalluto / CC BY 2.0. © Steven David Johnson. © Steven David Johnson. Clockwise from top: Sledding in the monument. 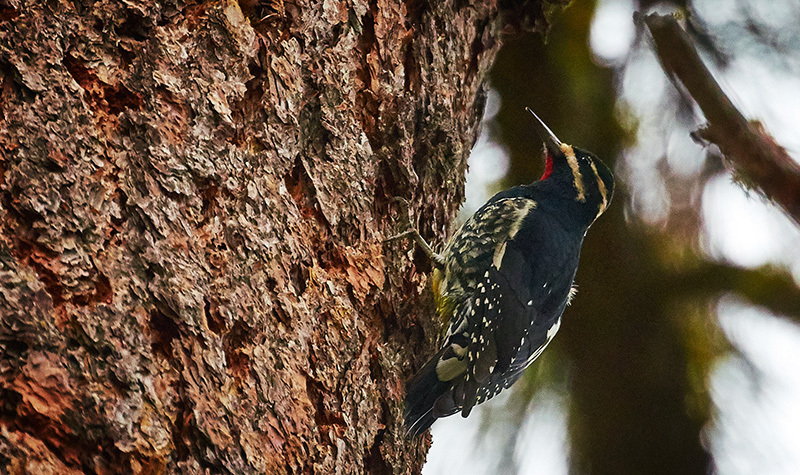 Adult male Williamson's sapsucker (Sphyrapicus thyroideus), near Hyatt Lake. 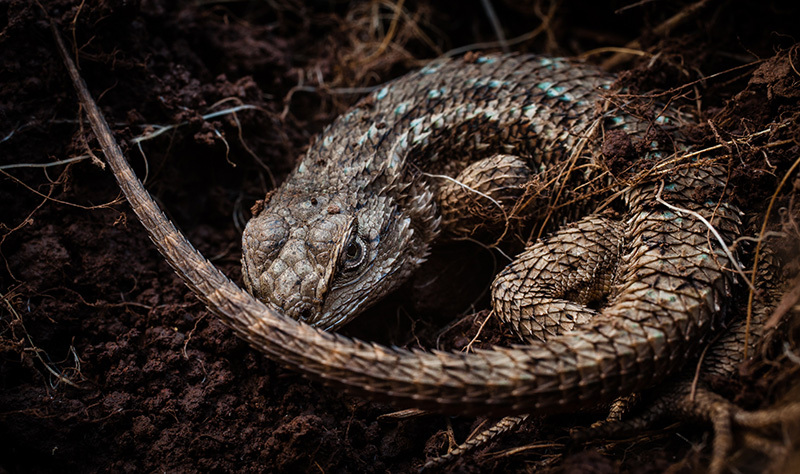 Western fence lizard (Sceloporus occidentalis) in the spring. Southern long-toed salamander (Ambystoma macrodactylum sigillatum) on lichen-covered rock, Parsnip Lakes area. From top: Sledding in the monument. Southern long-toed salamander (Ambystoma macrodactylum sigillatum) on lichen-covered rock, Parsnip Lakes area. Western fence lizard (Sceloporus occidentalis) in the spring. Left: Canyons of Grand Staircase-Escalante. Right: World-class dinosaur excavations at the monument have yielded more information about ecosystem change at the end of the dinosaur era than almost any other place in the world. Home to some of the most dramatic desert scenery in the West, Grand Staircase-Escalante National Monument is often described as a “Dinosaur Shangri-la.” In the two decades since the area was protected, paleontologists have unearthed fossils from 21 different types of dinosaurs previously unknown to science. Earthjustice, on behalf of conservation groups, successfully defended Grand Staircase-Escalante in the early 2000s when two Utah counties sought to expand use of off-road dirt bikes and ATVs within the monument area. How is Grand Staircase-Escalante particularly at risk? The work to establish Grand Staircase-Escalante in the late 1990's sparked lawsuits and proposals to curb presidential authority under the Antiquities Act. Monument opponents failed then, but the controversy continued—in part because of industries’ wish to exploit fossil fuels that lie beneath the monument. Without its protected status, Grand Staircase-Escalante would be vulnerable to coal mining and oil and gas development, according to an analysis from the Center for American Progress. 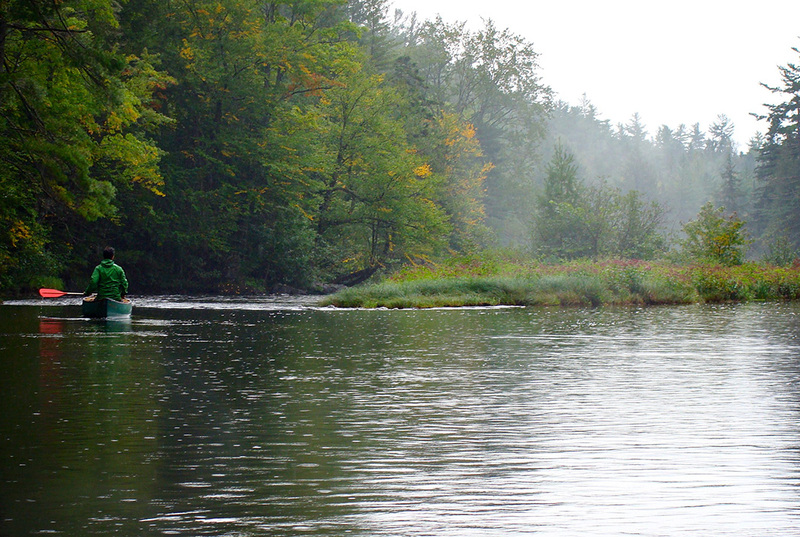 Paddling along the east branch of Penobscot. Ensuring lasting protection for a magnificent stretch of Maine’s North Woods, the Katahdin Woods and Waters National Monument is home to iconic forests, miles of pristine waterways and lush wildlife habitat. 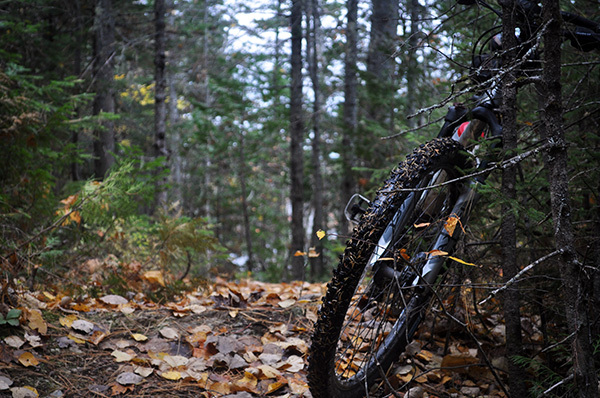 Katahdin is a favorite of visitors wishing to recharge with hiking, biking, cross-country skiing or fishing. 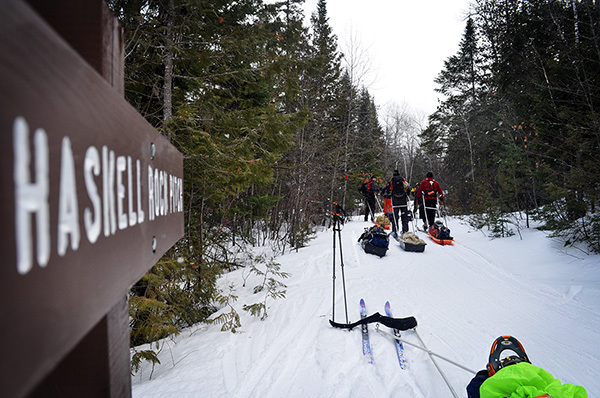 As a result of the public's input during meetings held prior to the designation, hunting and snowmobiling are permitted within the area, a first for a national monument. 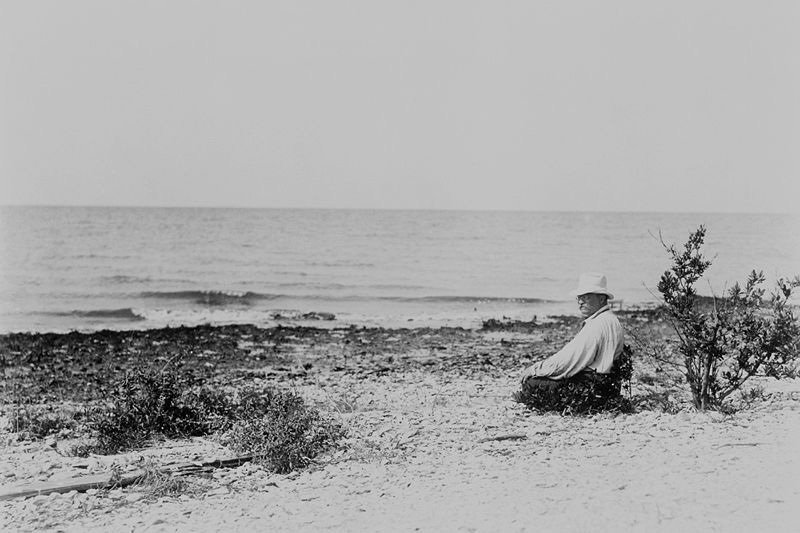 President Theodore Roosevelt, who signed the Antiquities Act into law, spent time in Katahdin in the late 1870s while recuperating from health issues. The area left a lasting impression on him and his desire to conserve nature for the enjoyment of all. John James Audubon, Henry David Thoreau and Percival P. Baxter are among the many notable figures in American history who had formative experiences in the woods of Katahdin. Left: Backcountry skiing, Haskell Rock Pitch, east branch of Penobscot. Right: Stair Falls View Trail. Top: Backcountry skiing, Haskell Rock Pitch, east branch of Penobscot. Bottom: Stair Falls View Trail. How is Katahdin Woods and Waters particularly at risk? Maine Governor Paul LePage, claiming the forest product industry will be hurt, has vocally sought to have the protections rescinded (in spite of the fact that small business owners near the monument are already reporting benefits from the monument). In May, the governor banned all official signs to the monument along main roads and interstates. 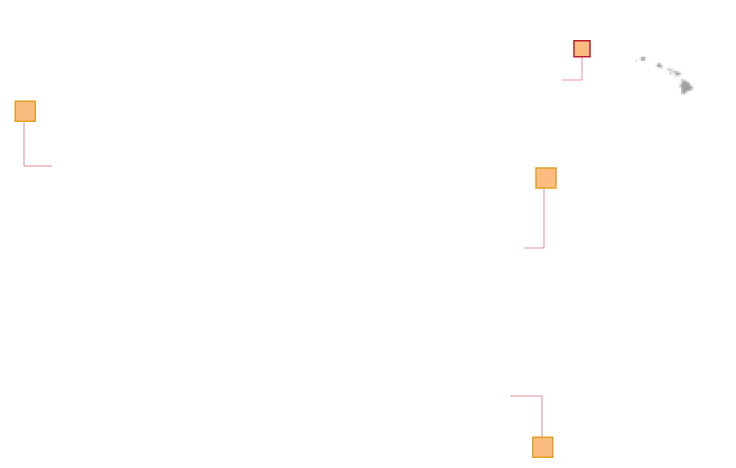 Clockwise from top left: Ctenophore that has ingested another ctenophore (visible within), between Powell and Lydonia Canyons. Chimaera, deep-sea fish, Lydonia Canyon. Rarely seen pompom anemone, Physalia Seamount. White sponge with purple crinoids, Retriever Seamount. "Feather star" crinoids on bamboo coral, Mytilus Seamount. Octopus, Physalia Seamount. The nation’s first major marine national monument in the Atlantic, the Northeast Canyons and Seamounts Marine National Monument is located off the coast of Cape Cod, Massachusetts. Centuries-old cold-water corals are the foundation of this deep-sea ecosystem. The four seamounts—biological oases of marine life—now protected by the monument are the only ones found in U.S. Atlantic waters. How are the Northeast Canyons and Seamounts particularly at risk? The deep ocean is becoming more accessible to oil and gas exploration and industrial fishing with each advance in technology. If remaining marine reserves are not permanently protected now, they risk being destroyed by resource extraction activities, including bottom-scouring fishing. With these areas will go some of our best hope for restoring ecosystems that have been devastated by decades of overfishing and development. Earthjustice is in court to protect this rare underwater national monument from a commercial fishing industry lawsuit. 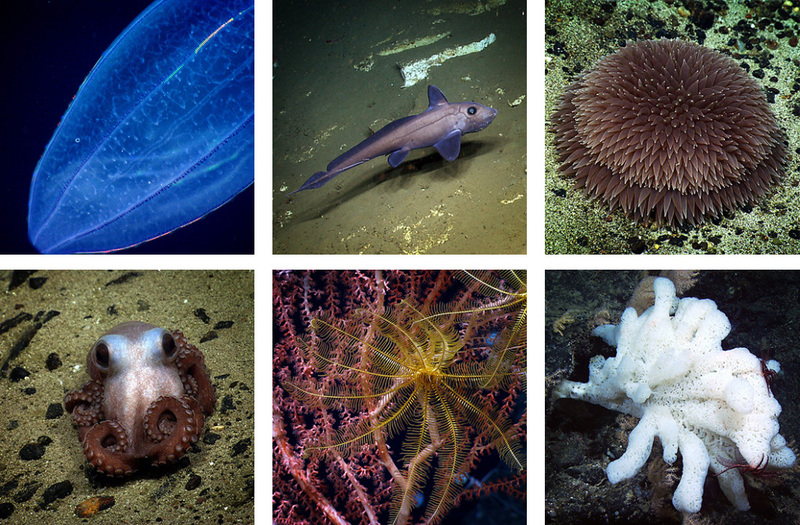 "There is no question," explained Earthjustice attorney Roger Fleming, "that President Obama met all legal requirements in carefully designing this monument to protect its rare deep-sea canyons and seamounts, and that he appropriately exercised the authority provided to him by Congress to protect and preserve this national treasure for generations to come." 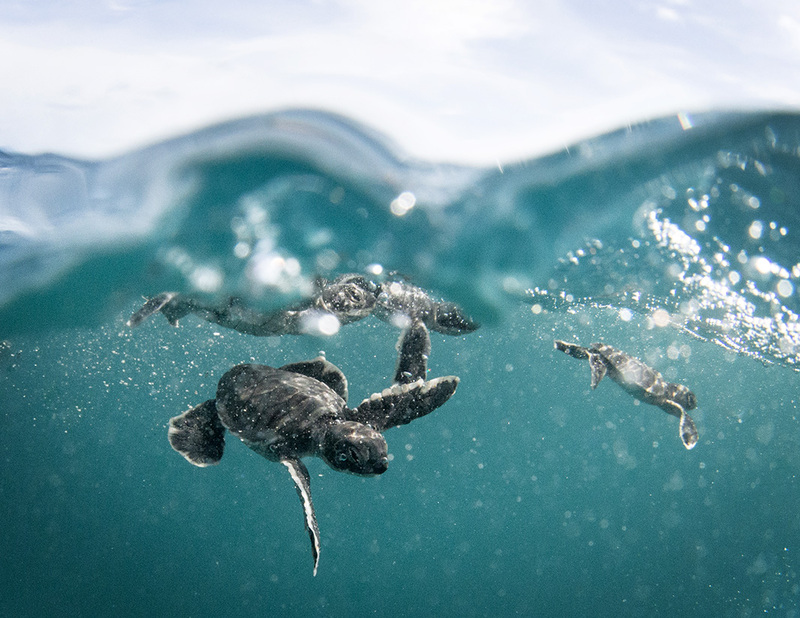 Baby honu (Hawaiian green sea turtles, Chelonia mydas). The undersea Papahānaumokuākea Marine National Monument is home to extensive coral reefs supporting 7,000 marine species, as well as important habitat for the threatened green sea turtle, the endangered Hawaiian monk seal, 22 species of seabirds and other creatures yet to be discovered. The protected area is also where Native Hawaiians believe all life began and where spirits return after death. Planning for the monument's expansion, which was supported by the state's governor, included more than 135 community meetings across all of Hawaiʻi’s islands. As a result of this dialogue, the final size of the expanded monument was changed to ensure access to fishing grounds used by small-boat fishermen. The Office of Hawaiian Affairs is a co-trustee of the monument, which gives Native Hawaiians a say in the monument’s management. A ceremonial shrine on Mokumanamana. 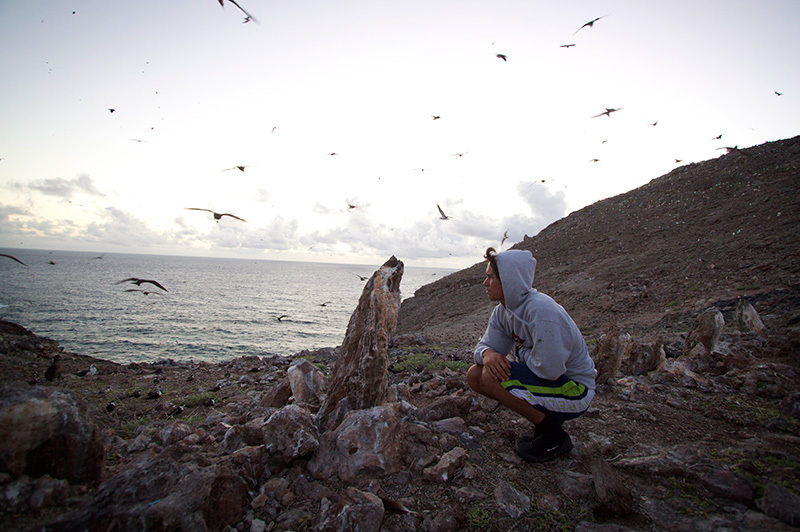 The island is known for its numerous wahi pana (storied places) and koehana (cultural artifacts). How is Papahānaumokuākea particularly at risk? Commercial longline fishermen oppose the monument, claiming that it restricts their fishing area. But Hawaiʻi’s longliners have no trouble reaching their annual bigeye tuna fishing quota; last year, it took just seven months to reach the quota. Despite the abundance of fish outside the monument area, the commercial fishing industry seems determined to maximize private profits at the expense of the public good. Attempts may be made to lift the restriction on commercial fishing in the monument area, roll back the monument expansion, or even reverse the entire monument designation. "Earthjustice intends to oppose any such efforts in court," said Paul Achitoff, managing attorney at Earthjustice. 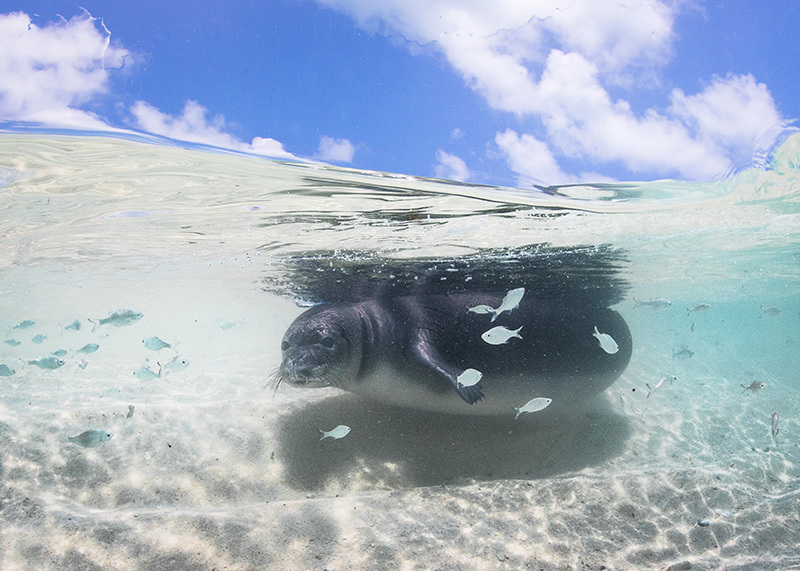 Top: Ilioholokauaua (Hawaiian monk seal pup, Monachus schauinslandi). Middle: A high-endemism deep reef fish community at 300 feet, Kure Atoll. Every fish in the video is a Hawaiian endemic species, meaning that they are not found anywhere else in the world. Deep reefs at Kure Atoll were discovered to have the highest levels of endemism known from any marine ecosystem on Earth. Bottom: Skin diver swimming with manō (Galapagos shark, Carcharhinus galapagensis). 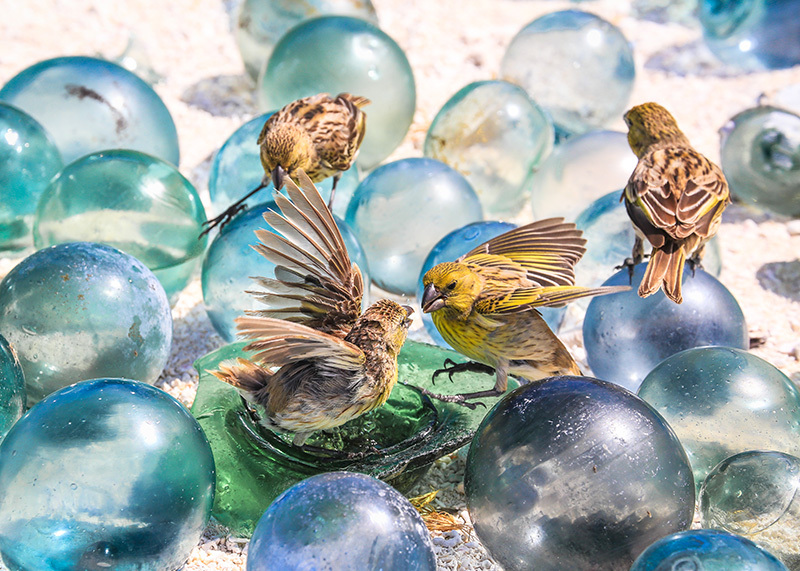 Clockwise from top left: ʻAinohu kauo (laysan finches, Telespiza cantans). Ilioholokauaua (Hawaiian monk seal pup, Monachus schauinslandi). Skin diver swimming with manō (Galapagos shark, Carcharhinus galapagensis). A high-endemism deep reef fish community at 300 feet, Kure Atoll; every fish in the video is a Hawaiian endemic species, meaning that they are not found anywhere else in the world. Deep reefs at Kure Atoll were discovered to have the highest levels of endemism known from any marine ecosystem on Earth. Earthjustice stands with you to defend national monuments. 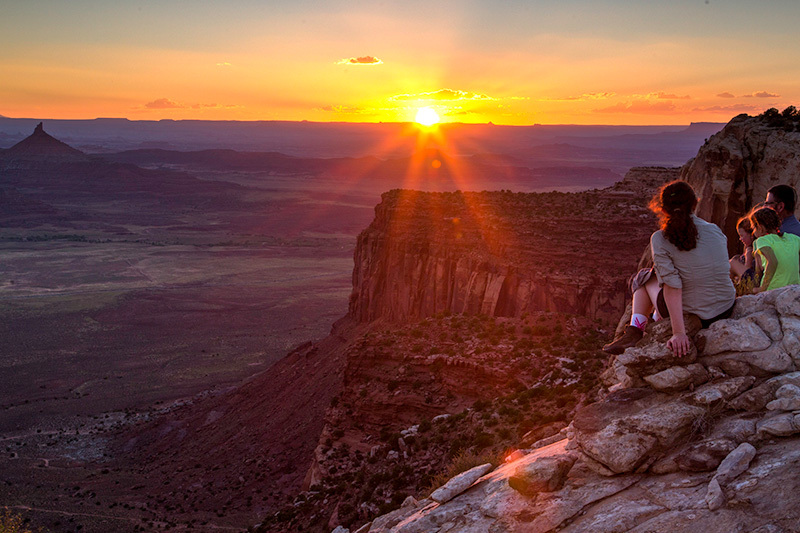 Since our founding more than 40 years ago, Earthjustice has successfully fought courtroom battles to save the best of our public lands from unchecked development and extractive industry. This work has extended to national monuments, including protecting Giant Sequoia National Monument from the logging of its ancient trees, halting plans for oil and gas seismic surveys in the Canyons of the Ancients National Monument, and—in a case that the U.S. Supreme Court declined to hear, letting stand the lower court decisions—the constitutionality of the Antiquities Act itself. Resources Photos and maps for media use are available for Bears Ears National Monument and Northeast Canyons and Seamounts. A June 2017 research study on the effect of national monuments on local economies, including Cascade-Siskiyou and Grand Staircase-Escalante, is available from Headwaters Economics.